Do you have the problem of the bag too big or too small? Too heavy at times? Our new fashion foldable reusable bag are not just lightweight and has huga capacity but also very fashionable, anti wrinkle and water proof! 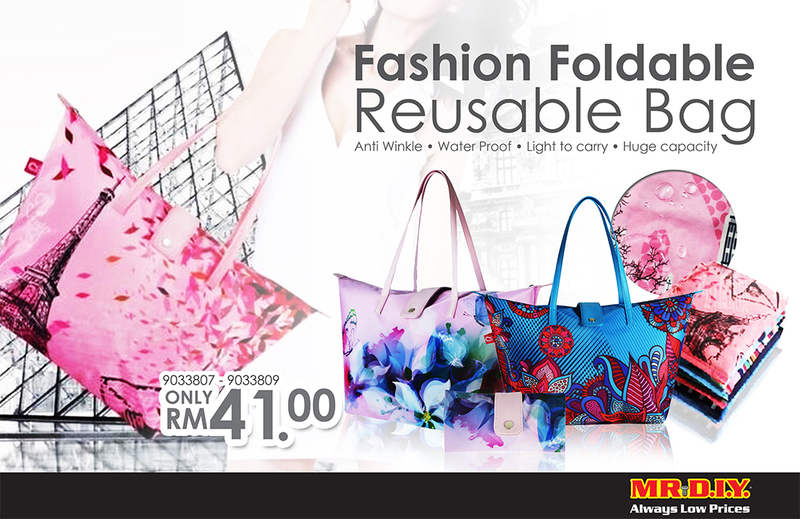 Your recycle bag has never been so stylish that it can even being carry as everyday hand bag. It comes in various design and color that suits your mood and OOTD. We have also have it in a different handle and shape that resemble a plastic bag. You can fit in anything you want, to the beach, to the market, go for shopping, go for picnic, hit the gym and etc. In conjuction with the implementation of the new rule formulated under the Solid Waste Management and Public Cleansing Management Act 2007 that waste should be saperated starting in September, it is also a great time to remind us that we should always reduce, reuse and recycle. So we should always bring a reusable bag whenever we go for shopping and say no to plastics bags. ‘Recycling Is The Responsibility Of All’ , start using a recycle bag today! This entry was posted on September 12, 2015 by mrdiy2u in Accessories, MRDIY and tagged antiwrinkle, bag, foldable, lightweight, recycle, reusable, waterproof.